Jan. 30, 2011, 7 p.m.
By Megan Garber @megangarber Jan. 30, 2011, 7 p.m.
i’m heading for Egypt, and I think I can get in. Depending on Internet/phone access, I hope to FB, tweet, blog and columnize soon. So any suggestions? What should I focus on? What are you most interested in? I’ve arrived in Egypt! Amazing scene. Thanks for all your suggestions; I’ll be FBing, tweeting, writing, if I can get on line. Borrowing a sat phone now. Tahrir Square is just unbelievable–first time I’ve ever strolled across it without worrying about traffic. Just tanks and thousands of protesters. Everybody’s very hopeful and very nervous. He’s since added two more updates to the page, describing the “giddy” mood at Tahrir Square, the campfires built by protesters in the street, the ominous quiet of a post-curfew Cairo. What’s resulted is a kind of running narrative — liveblog meets tweetstream meets reporter’s notebook — of Kristof’s observations about something so many people in the world want to know about right now: the situation — the real situation — on the ground in Egypt. The columnist’s pithy updates have occasioned several hundreds of comments from Facebook users — 575 so far for Kristof’s announcement of his trip, 169 for his arrival update, and 261, combined, for the next two. Many of the them are simple, kind expressions of gratitude and caution — “Please be careful” is perhaps the most common reaction to Kristof’s reporting — but many of them are also astute observations about, among other things, the political future of Hosni Mubarak, the validity of comparing Cairo’s unrest to Tiananmen’s, and the role that the media both within Egypt and outside of it are playing as the situation escalates. There are a couple things to note here, I think. First, the commentary Kristof’s reporting has inspired. It’s often said that Facebook makes for a much better commenting platform than news outlets’ websites do — Lois, quoting NPR’s social media guru, Andy Carvin, noted something to that effect last week — and Kristof’s page certainly suggests that. It’s partly that Facebook is, implicitly, a more personal, and personalized, platform for news consumption than, say, The New York Times’ website; it’s partly that Kristof’s page is meant as, essentially, a fan page; it’s partly that Facebook, with its Like-buttons-but-not-Dislike-buttons, in general creates a positive environment that, likewise, encourages positivity. But there’s something else, too: Facebook integrates user commentary in a way that most news organizations don’t. The way Kristof’s page is laid out, his reports appear almost as another comment in a thread — just slightly bigger, slightly more prominent than the others. On Facebook, when you’re commenting on a story, you’re not just responding to it; you’re becoming part of it. You’re aiding in its creation. The second thing to note is the narrative. It’s fascinating to observe how the running nature of Kristof’s reports changes the value proposition of the story he’s telling. In his Facebook reporting, time is an implicit, and important, component of his narrative. Kristof, in being in Egypt right now, is in danger; a new update offers not merely a new piece of information about Egypt, but also the reassurance that he’s okay. Compare that tension to his newspaper columns, which are — even online — generally static productions that step out of time. In some sense, in fact, they try to overcome time: They challenge the vagaries of the news cycle by highlighting stories that don’t have explicit news pegs. Kristof’s Facebook reports, on the other hand — like his Twitter feed fleshed out — treat “the present moment” not only as their subject, but as their point: This is what I’m seeing now. No varnish — and very little artistry. And that makes them particularly compelling. Kristof certainly isn’t the first journalist to tap the narrative power of Facebook for his reporting. The Wall Street Journal experimented, to great success, with direct-to-Facebook narratives after last year’s earthquake in Haiti — and The Washington Post has done amazing work using Facbeook updates as raw material for more traditionally constructed narratives. And there are many more where that came from. But Kristof isn’t just active on Facebook; he’s also active on Twitter — and, again, a prolific print columnist. Ostensibly, he will be using all of those platforms, and possibly more, to report on Egypt. In that, his Egypt coverage offers — in addition, of course, to valuable reporting — a kind of case study on how different platforms can be leveraged to tell a story. In real time, and beyond. POSTED Jan. 30, 2011, 7 p.m.
Garber, Megan. "Nick Kristof turns to Facebook to report from Egypt." Nieman Journalism Lab. Nieman Foundation for Journalism at Harvard, 30 Jan. 2011. Web. 18 Apr. 2019. Garber, Megan. "Nick Kristof turns to Facebook to report from Egypt." Nieman Journalism Lab. Last modified January 30, 2011. 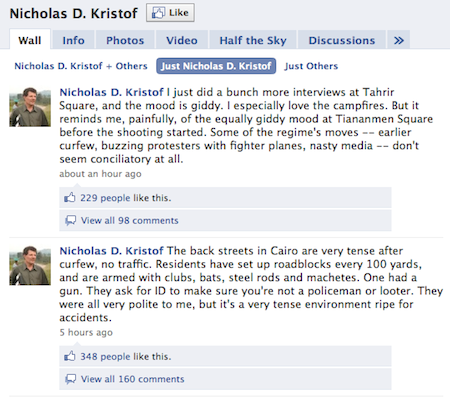 Accessed April 18, 2019. https://www.niemanlab.org/2011/01/nick-kristof-turns-to-facebook-to-report-from-egypt/.